You’re getting deep into your latest video game purchase when all of a sudden you feel a twinge of recognition. Isn’t that the voice the guy from that thing you watched? Big names providing voices for video game characters is nothing new, but in the last few years it has become ever more common. To show you just how many movie stars are lending their voices to games, we’ve brought together this list. One word of warning, however — this does seem to be an area dominated by male actors. To qualify for the list, these big names must have appeared in two or more non-movie franchise video games — often without you realizing. We’ll start with the Goodfellas actor, whose starring turn in Grand Theft Auto: Vice City (CA/UK) (one of several PC games you can play on Android 10 Classic PC Games You Can Play On Your Android Device 10 Classic PC Games You Can Play On Your Android Device Want that PC gaming experience on your phone or another Android device? These 10 PC games available on Android are sure to entertain you and bring back memories! Read More ) was a pivotal moment in the use of Hollywood names in video games. Before Vice City, it just happened occasionally, usually in motion picture tie-ins. The watershed is surely Liotta’s turn as Tommy Vercetti. 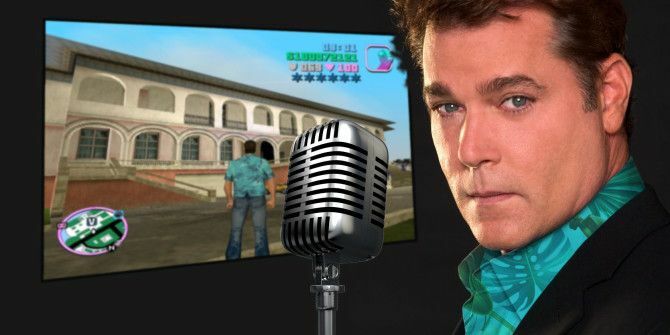 Liotta — whose voice work made the unpleasant Vercetti a likeable hero — isn’t the only big name in Vice City. Lee Majors, Burt Reynolds, Philip Michael Thomas (star of Miami Vice, upon which the game is loosely based), Fairuza Balk, and Danny Dyer all star. This cast list is perhaps the most illustrious ever assembled for a game — it certainly beats most movies! With an amazing 17 video games under his belt, McDowell made his first digital appearance in 1994’s Wing Commander III: Heart of the Tiger as Admiral Geoffrey Tolwyn. Following years of drifting on the fringes of success, this coincided with his memorable performance as obsessive villain Soran in Star Trek: Generations. It’s fair to say that the success of the Wing Commander III series made video games a lucrative option for A-list actors after McDowell’s appearance. Since then, he’s appeared on other Wing Commander games, Fallout 3, the Everquest series, Command & Conquer: Red Alert 3 – Uprising, Elder Scrolls Online (CA/UK) (still going strong — but should you play it? Should You Buy The Elder Scrolls Online? Should You Buy The Elder Scrolls Online? The Elder Scrolls Online, is now live for players in North America and Europe. It promises open, multiplayer gameplay, but it sells for full retail with a subscription fee. Is it worth it? Read More ), and in 2016, Gorod Krovi. McDowell’s career effortlessly demonstrates how a big name can switch between movies and video games. In a career spanning almost 70 years, Christopher Lee — who died aged 93 in 2015 — appeared in over 200 movies, often as the star. From one of the greatest Bond villains to Dracula himself, it should come as no surprise that he made a few video game appearances. With 17 appearances in total, it’s fair to say that eight of these are movie tie-ins, whether Lord of the Rings, The Hobbit, James Bond, or The Rocky Horror Show. But Lee is in a couple of game-only franchises, too: the Kingdom Hearts series, along with Everquest II, Deus Ex Machina 2, and Freelancer. A huge 22 video games appear on Sir Patrick Stewart’s IMDb entry, but the vast majority of these are Star Trek (learn how to catch up with 50 years of space adventure The Easy Way to Catch Up on 50 Years of Star Trek The Easy Way to Catch Up on 50 Years of Star Trek Star Trek has been around for 50 years, and that means there's a lot of content for completists to wade through. Thankfully, there is an alternative way of catching up on 50 years of Star... Read More ) and X-Men tie-ins. The former Shakespearean stage actor first hit the videogames market in 1994, voicing King Richard in Lands of Lore: The Throne of Chaos, an RPG from Westwood/Virgin. Ten years later came Forgotten Realms: Demon Stone as Khelban ‘Blackstaff’ Arunsun, Elder Scrolls IV: Oblivion (UK) in 2006, and the two Castlevania: Lords of Shadow games as Zobek. Let’s hope Sir Patrick Stewart contributes his vast talents to some other titles soon. When he’s not playing starring roles and being killed before the rest of the cast on screen, Game of Thrones favorite Sean Bean voices video games. And sometimes gets killed early. Since his appearance in The Elder Scrolls IV: Oblivion, Bean has punctuated his on-screen deaths with characters in Papa Sangre II, Kholat, and in 2016, Civilization VI (CA/UK). Here, he plays the role of narrator, following in the not-inconsequential footsteps of Leonard Nimoy and William Morgan Sheppard. Like his movie career, the late Dennis Hopper’s videogame appearance is eclectic. No major franchises, no movie tie-ins, just a quartet of unique titles that you should take a look at. First up is Hell: A Cyberpunk Thriller in which Hopper played the voice of Mr. Beautiful. Next was 1998’s Black Dahlia, a fondly-remembered, point-and-click adventure game inspired by the real life Cleveland Torso Murderer. Following 2002’s Grand Theft Auto: Vice City (see above) came one of Hopper’s final roles, in Deadly Creatures. This unusual Wii title also stars Billy Bob Thornton, with the actors providing a narrative for the battles between various desert creatures. Legendary comic writer, actor and performer John Cleese, founder member of the Monty Python comedy troupe (here are some of their best sketches 8 of the Best Monty Python's Flying Circus Sketches [Stuff to Watch] 8 of the Best Monty Python's Flying Circus Sketches [Stuff to Watch] Very few other comedy troupes have broken as much new ground as Monty Python did when they were first broadcast on the BBC in 1969. Not only was the humour fresh, well-delivered and very, very... Read More ), co-creator and writer of Fawlty Towers, has also done video games. Most recently, Cleese’s voice has enlivened Elder Scrolls Online, but beyond a couple of Bond-related movie tie-ins, he also voiced The Bomb in Douglas Adams’ Starship Titanic, and characters in Jade Empire and Fable III. Perhaps his most amusing appearance, however, is in the Nintendo DS puzzler Smart As, a socially-networked brain training game with dialogue and questions by Dean Wilkinson. Coincidentally, Wilkinson had just finished work on the game when we interviewed him back in 2012 A Day in the Life of a Videogame Scriptwriter [Feature] A Day in the Life of a Videogame Scriptwriter [Feature] If you’ve ever played a videogame that you really enjoyed, chances are you haven’t noticed the characters or any speech in the game – or if you have, you probably won’t have considered that they’ve... Read More . The star of The Hobbit naturally appears in various franchise movie tie-ins, and is notable in this list for appearing as “video game boy” in the 1989 videogame tie in to Back to the Future Part II. But what other games does the actor appear in? The Legend of Spyro: A New Beginning was released in 2006, in which Elijah Wood voices the title character, and reprised it in two sequels in 2007 and 2008. Meanwhile, 2010’s God of War III saw an uncredited appearance as “Kratos’ brother”. Wood also appeared in 2014’s Broken Age. Easily one of the most recognizable voices on the planet, Jackson’s starring role as Nick Fury in the Avengers movie series means that he has obligatory appearances in the videogame tie-ins. But what other games has he graced? It all started for Jackson with 2004’s Grand Theft Auto: San Andreas, in which he appeared as Officer Tenpenny (see below, language NSFW). Like Vice City, the sequel San Andreas has a massive case of familiar movie names. Six years later, Samuel L. Jackson appeared as himself in Heroes of Newerth, an award-winning, cross-platform online battle arena. Heroes of Newerth went free-to-play in 2011, and you can check it out at www.heroesofnewerth.com. No list of the Hollywood stars in video games can be complete without a mention of the master (or Jedi Master) himself, Mr Mark Hamill. Since 1993 he has clocked up no less than 42 video game appearances. Around half of these appearances have been in Batman video games, where he reprised his cartoon appearance voicing the Joker. But that leaves another two-dozen or so appearances in big titles such as Call of Duty 2, Master of Orion: Conquer the Stars, Lego Dimensions (UK), and the Wing Commander series. That’s our list, but we reckon we’re only scratching the surface. Which famous voice have you spotted in your favorite video game? Who would you have expected to see in the list? Tell us in the comments! Great list! Gotta say mine is the combo of Christopher Walken, James Hong, CCH Pounder, Michael Madsen, and Gary Oldman all in True Crime: The Streets of LA.